i've been trying to write this post for a few weeks now, and no matter the angle i think i'm going to take, nothing feels "right". i don't feel educated enough to talk about the history of the area, nor did i feel like an area guide would be fair - because truth be told: we didn't spend enough time in the one place to really know where to eat and drink - we found recommendations as we went, or worked from a list of pre-recommended places we had been given before the trip. 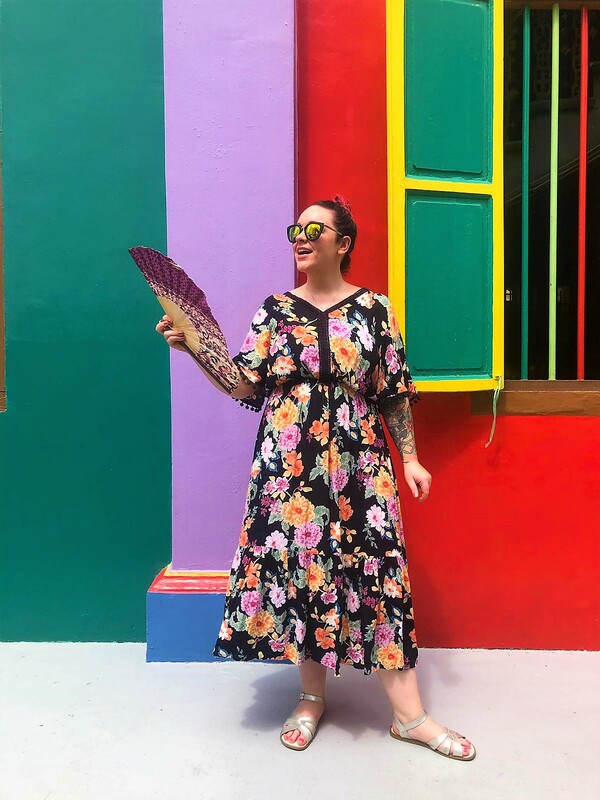 also: singapore was a holiday for me, not a "content opportunity" - so i didn't really pay too much attention to where and when and how and why. 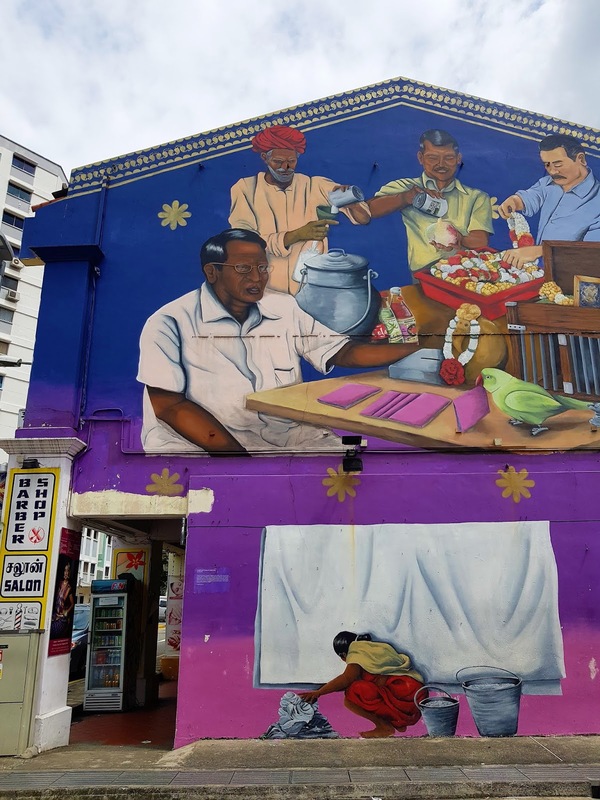 so, i guess my only option is to give you the colourful highlights - the best bits - the bits i'd recommend on to others, so.. without further ado i present to you, a colourful guide of little india. 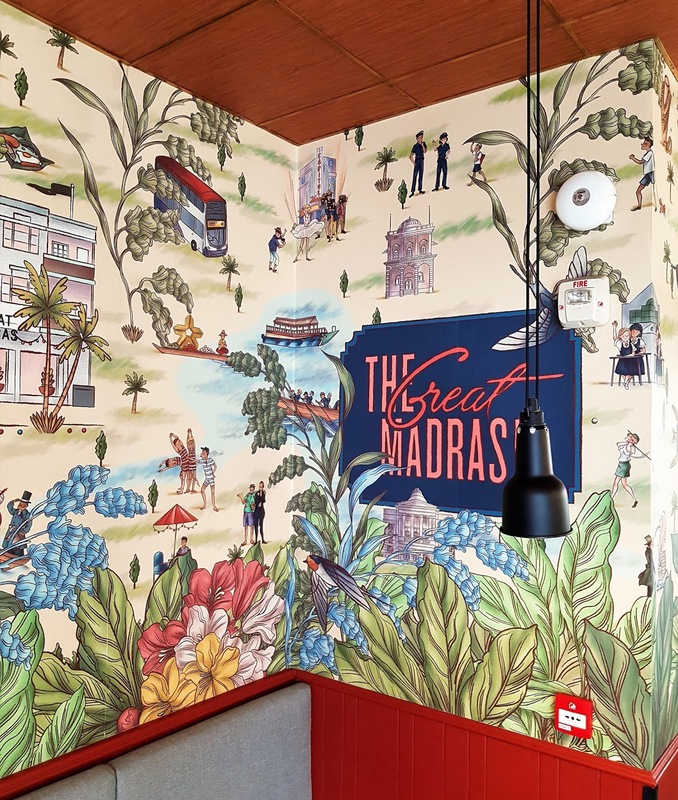 you will have read this in my previous post about singapore, but the highlight of our hotel stay was the gorgeous great madras hotel. we didn't technically stay here, but we ate breakfast here almost every day of our stay, and those lazy breakfasts were enough for me to know i'd definitely like to stay here next time. 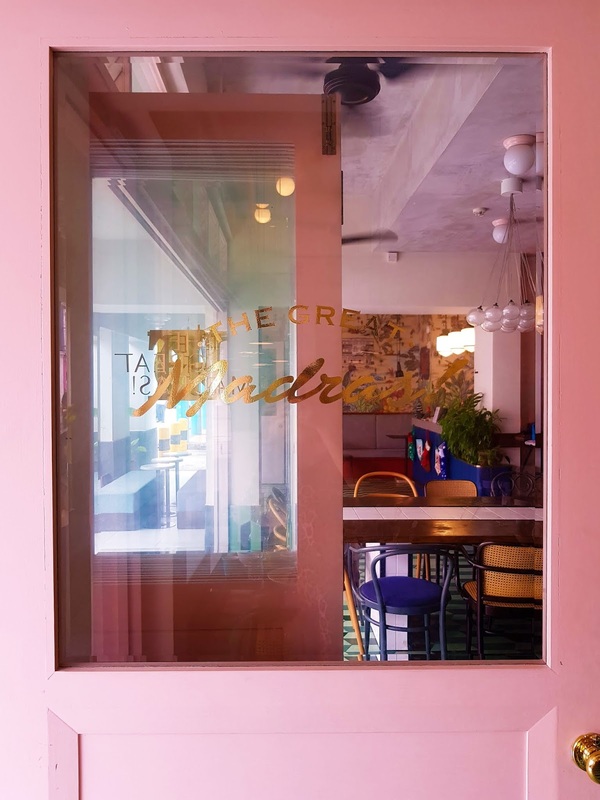 the 1920s art deco building and the pink flamingo neon sign were literally the tip of the iceberg, with the pastel paint, quirky wallpaper, and modern-retro furniture inside the real selling point. 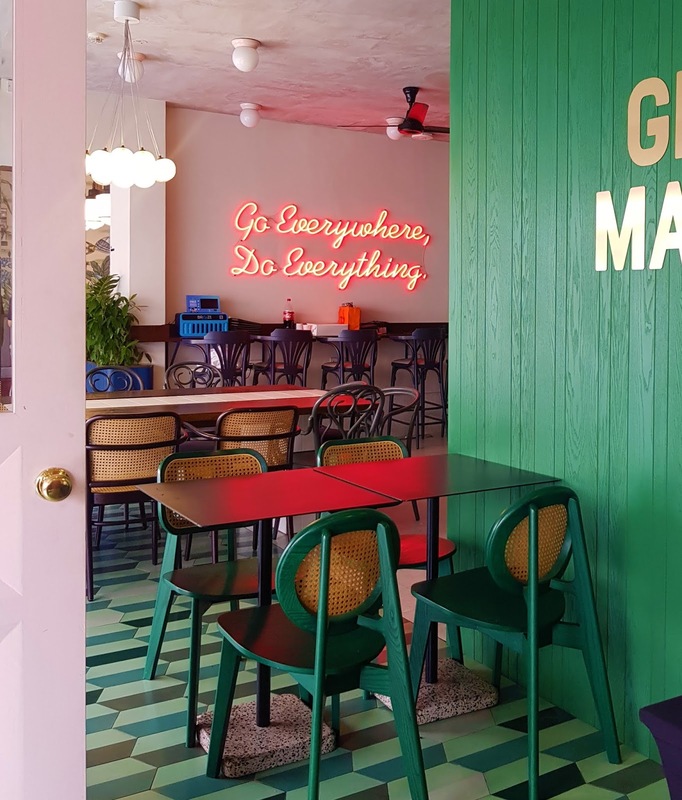 every corner of the hotel's lobby was perfectly curated, colourful and super kitsch, and it was seriously the greatest little hotel in the area. 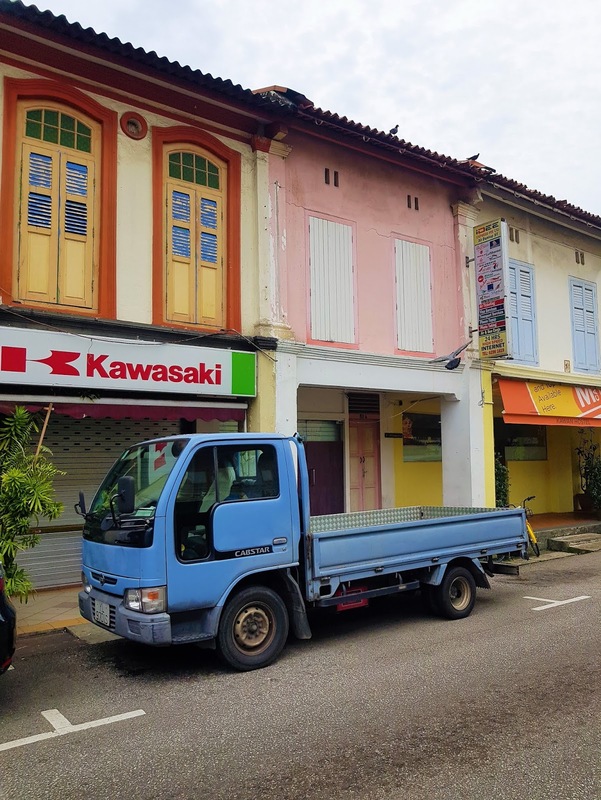 this building is one of the reasons i wanted to stay in little india. having seen glimpses of it numerous times on social media and travel blogs, it was one of those landmarks i wanted to see with my own eyes - and, parts of it did not disappoint. 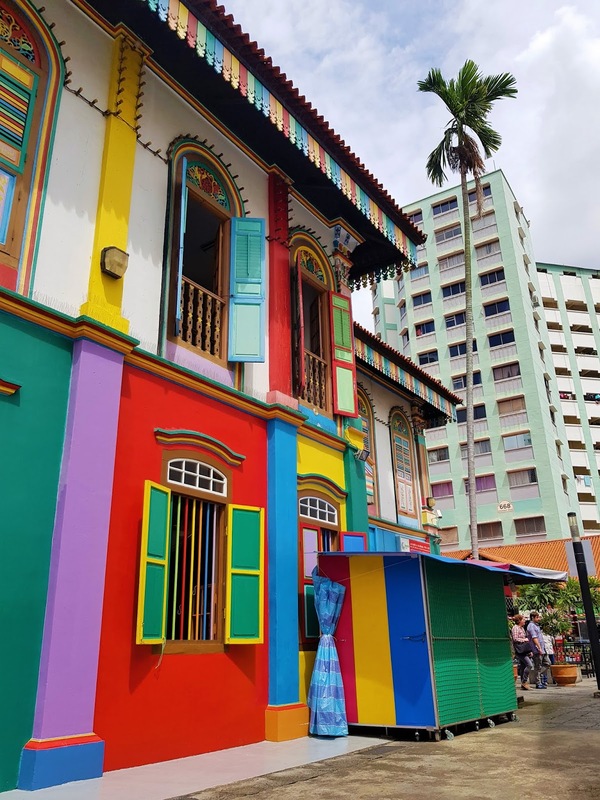 the traditional chinese house is now home to a random shop, and seems to have endless restorations happening around it, meaning the gorgeous, colourful facade is often covered with scaffolding. annoying if you're a tourist and only have a few hours to spend there (and want to get the shots for the gram), even more annoying if you're trying to run a business in the vacinity (and there are plenty of them). because the throng of tourists not interested in their wares and more interested in the building was rather large. still, one side of the building is out of the way of the business trade, and the ideal spot for photos - and regardless of how many times you've seen it online, there's nothing that beats seeing the glorious and insane paint job in person. 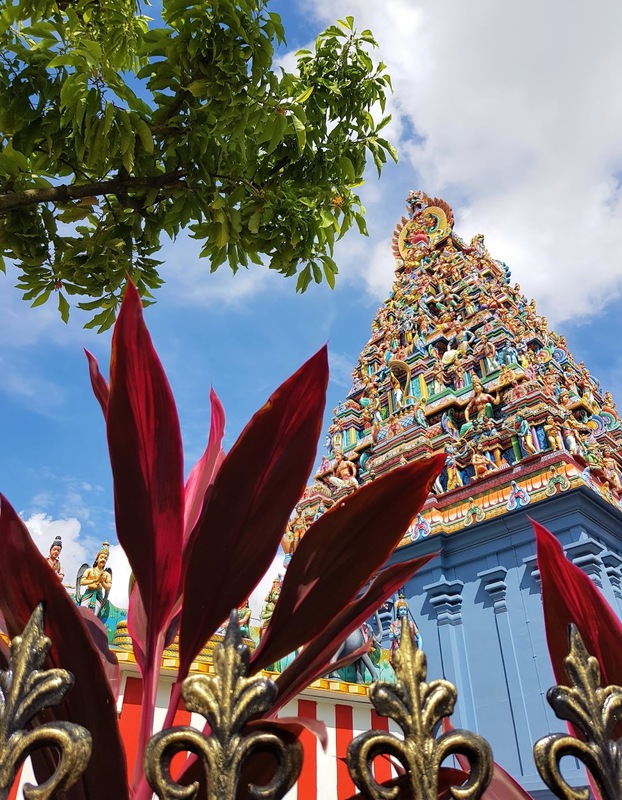 these are two of the oldest hindu temples in singapore, and they're both in little india. 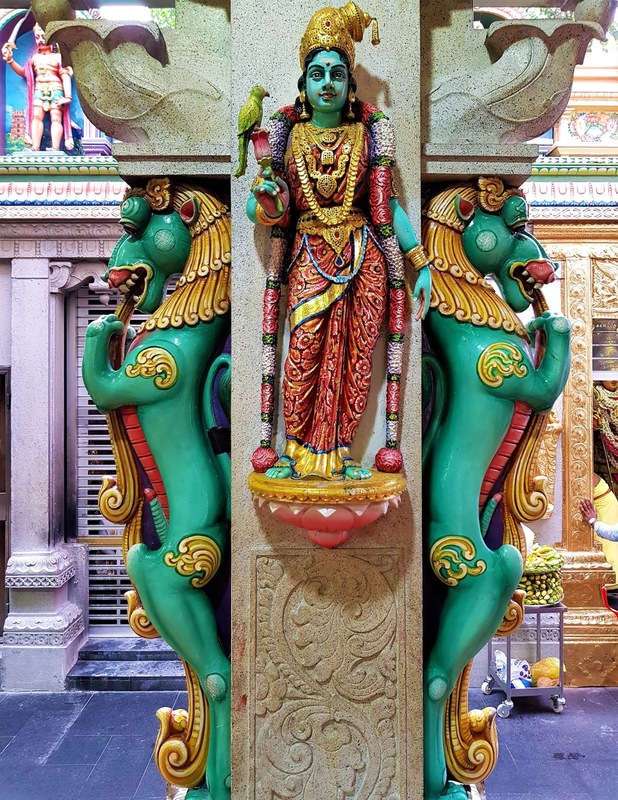 the former is dedicated to the hindu goddess kali, while the latter is dedicated to perumal (or, vishnu). and, here's the thing: i have no problems going into catholic or christian churches, as i feel educated and researched enough to understand and be respectful to the space and the beliefs. but, i know nothing about hinduism, and felt very odd being in a place of such respectful worship with a camera and ogling eyes. not that i'm not respectful, i am; i took my shoes off and covered up and bowed my head with the best of them, but there's a real difference between being an onlooker and a participant; i felt out of place, awkward, and disrespectful, so i didn't stay inside too long. i knew i was only there because of how beautiful and colourful the buildings, statues and ornaments were, and that's not a good enough reason to be inside someone's spiritual building - in my opinion. still - it's a beaut from the outside, too. you have to see it for yourself! 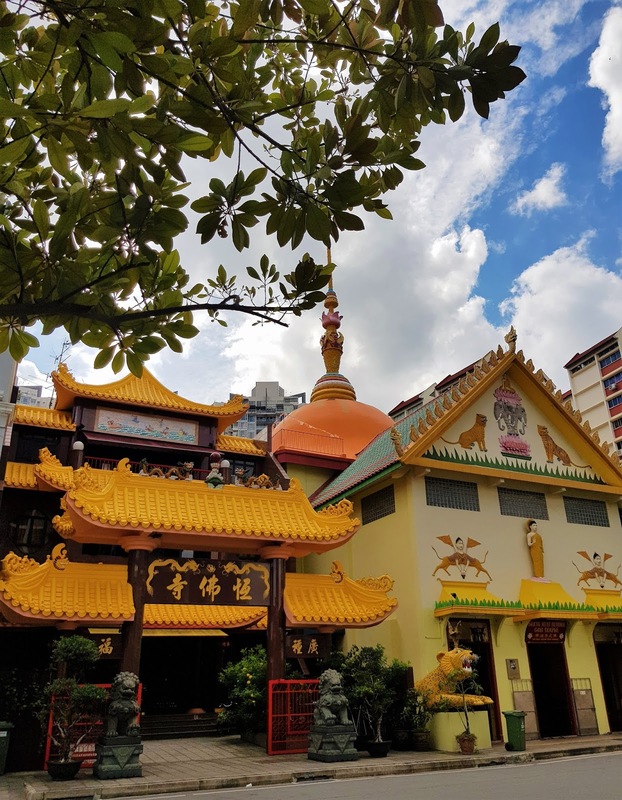 similar to the above, i definitely wanted to visit the buddha gaya temple (or: temple of 1000 lights) while in little india, but, i didn't feel right going in. especially as there were only a few people inside - working - and not another tourist in sight. 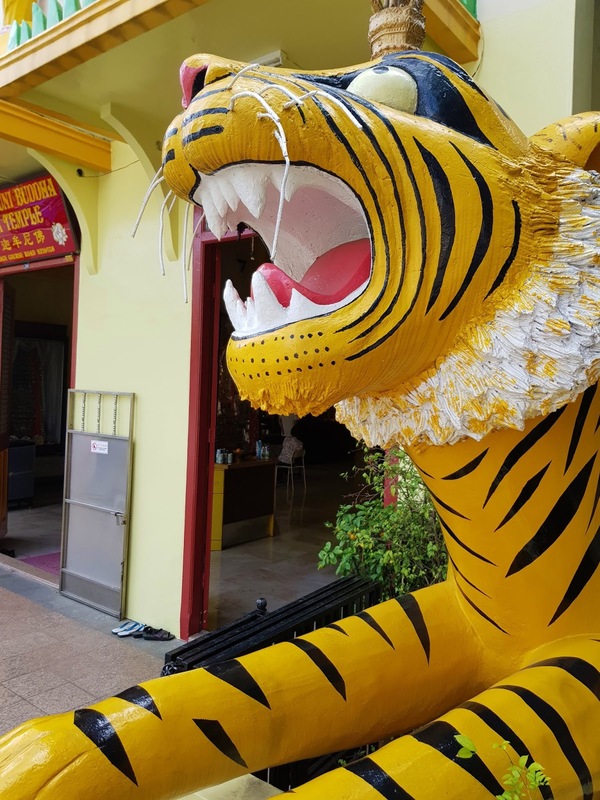 we were able to spot the temple a while away from the entrance, thanks to the giant cat statues adorning the outside. a leopard to the left and a tiger to the right, the bright yellow animals were essentially what we came to see really. 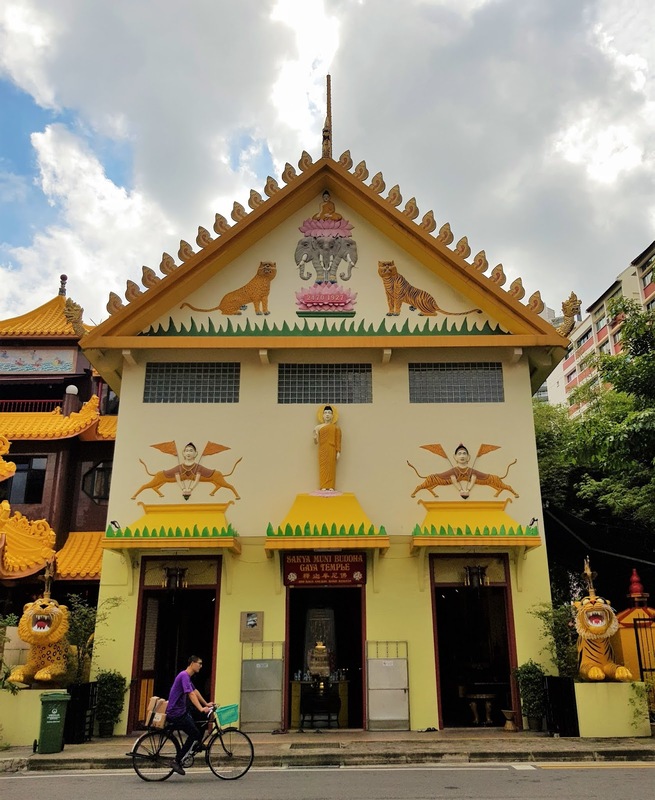 although, there is genuinely a massssive buddha statue inside the temple that does have to be seen to be believed, though you can see it through the large archways into the building, so you don't even need to go in to admire the beauty of this stunning temple. 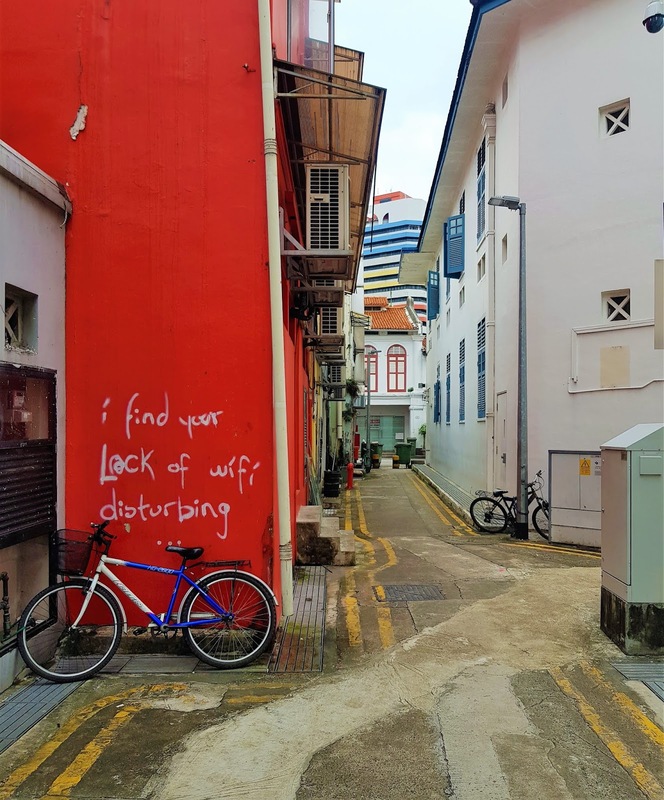 which is everywhere, on every corner, in every alleyway, and on every wall in singapore. 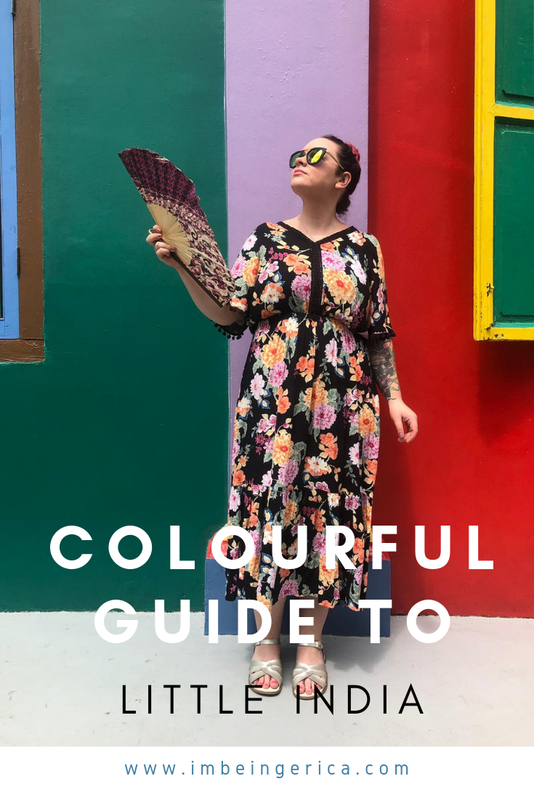 it's really, truly everywhere, and that makes being a colour hunter really very easy. it does, however, make it hard to write a blog post about where to find it, because, i don't have a clue to be honest. 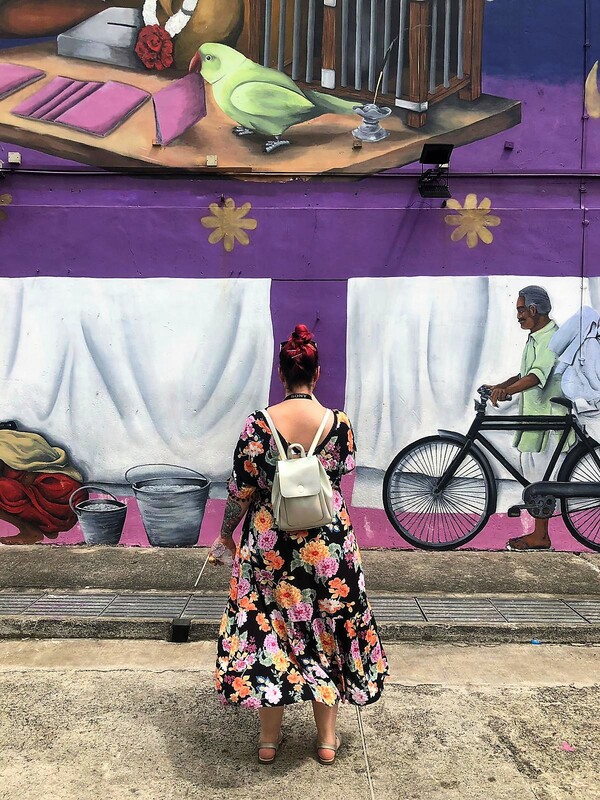 we would be wandering to lunch, or from one site to another, and we would just spot the most incredible paintings on the sides of buildings. 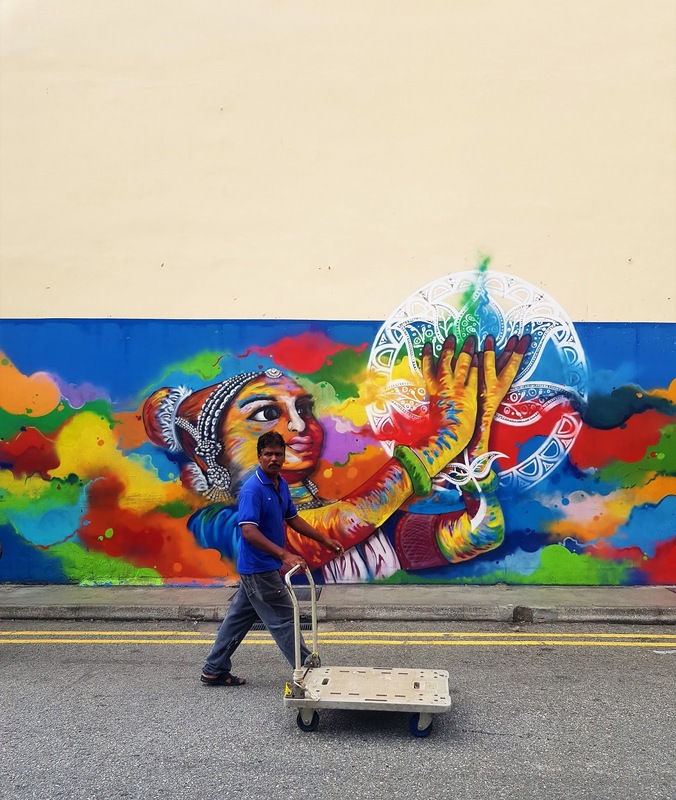 often they weren't tagged with the artists' names, which was a real shame, but at least you know you will definitely get a full dose of colourful artworks no matter where you start your hunt in little india. another one for the "i can't tell you where it is" books, because as above: the colour is just about everywhere you rest your eyes. 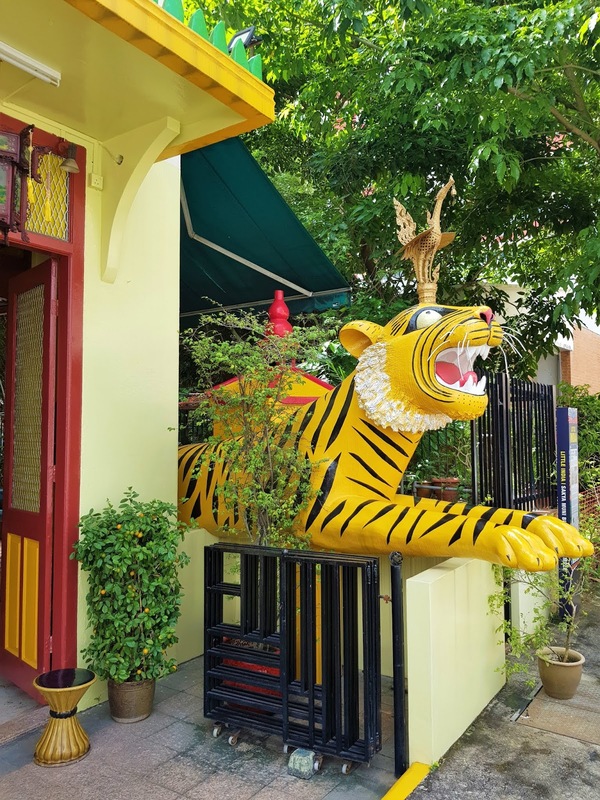 it was an overwhelming amount of colour, with the contrasts and clash and various hues coming at your from every doorframe and window on every house or shop. 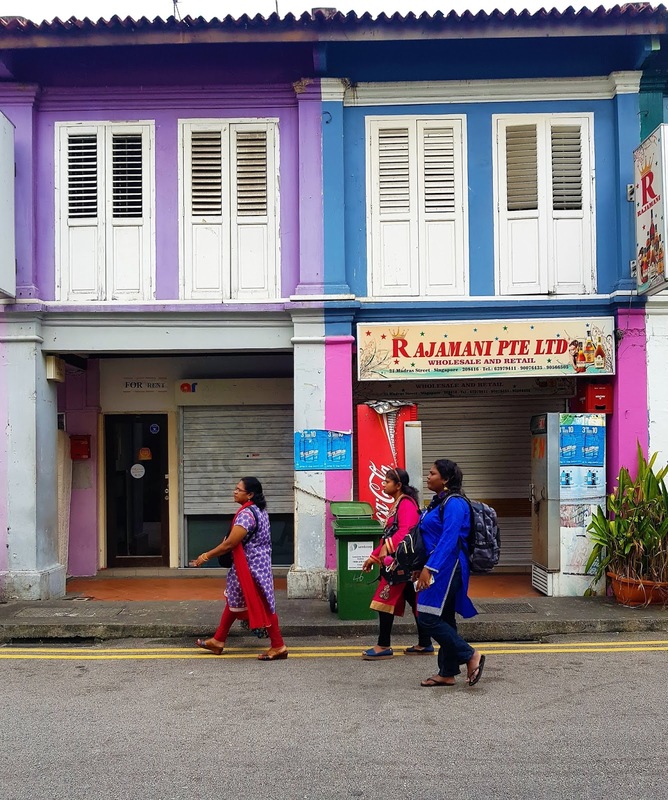 again, it was a treasure trove for the colour hunters among us, but if that's not your vibe, then you're going to hate little india. because who doesn't love a colourful market, eh? 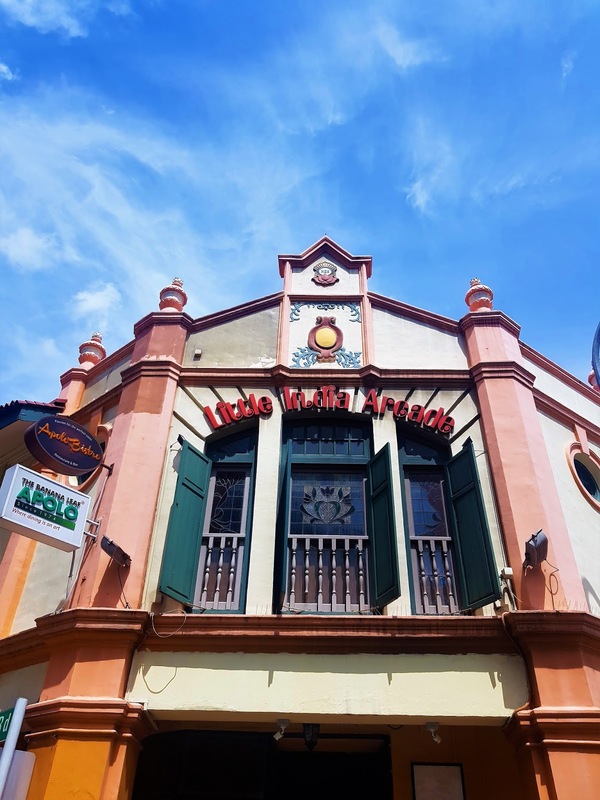 whether it be food or fashion, both the tekka centre and the little india arcade were alive with colour, confusion, and the irksome presence of shopkeepers deperately trying to sell you their wares. some were lucky, obviously, because who doesn't love a bargain sunnies and souvenir purchase, but others were downright bothersome. honestly, they're more offputting than helpful when you're trying to decide which of the three tea canisters your mum would like, and just how many embroidered bags are too many, and will you even use it back in london? but colour? full of it. just, be prepared to be vexed. 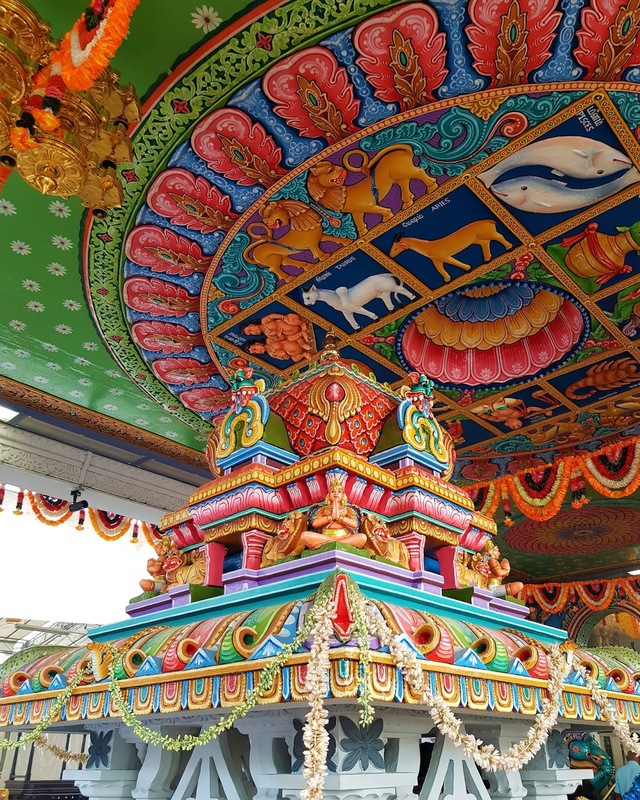 so, there you have it - a colourful glimpse of little india. obviously, we did and saw so much more while there, but as i mentioned at the start: i was on holiday. i wasn't taking notes, i didn't always pay attention, and i wasn't thinking about how i could market my trip. 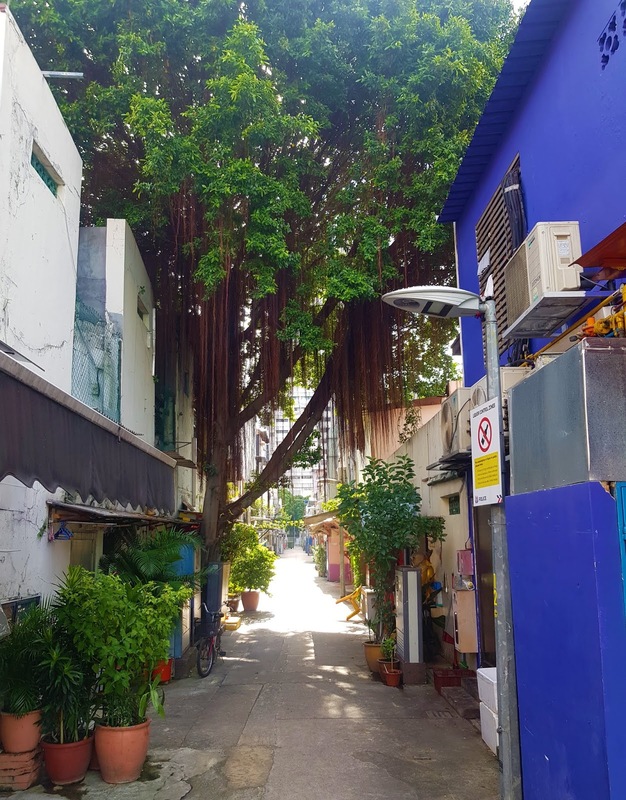 rather, i was relaxed, happy, and having a gorgeous time in a new country, and the colours are what i remember of my time in little india. 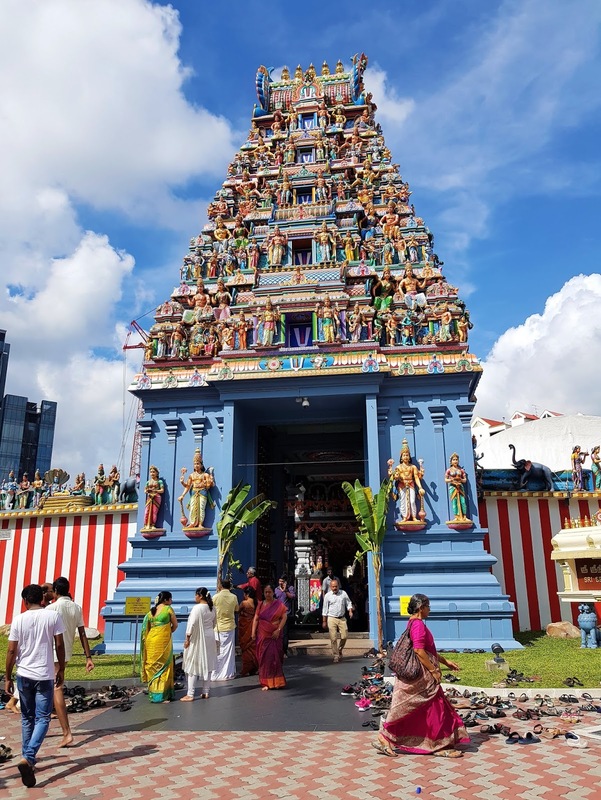 so, i'd love to know what you thought of little india - have you been, or do you plan to?